A beautiful natural paper decorated with flowers logo mockup to showcase badges, logo design, monogram, logomark, typography, logotype etc. There are three different effects that can be applied from the premade effects folder. Place your logo design inside smart object and get a super realistic outcome of your artwork. 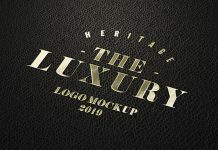 For more logo design mockups visit our branding section and do not forget to subscribe and receive free mockups by email.